It seems like every other week these days we’re blessed with the release of a new social deduction game in a small box. Whether you’re trying to prevent the president from getting exploded, confusing a hidden spy with double-entendre’d communiques, or rooting out the werewolves in one night, short hidden role games for big groups are in. But have you ever thought to yourself, “I do sure love these hidden-role games, but I think I would prefer to choose which role I get to play”? 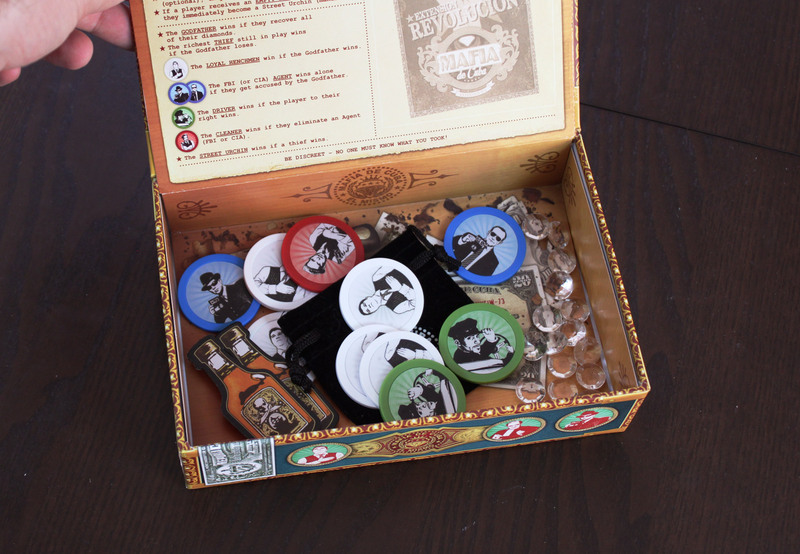 Well, Mafia de Cuba might just be the game for you. 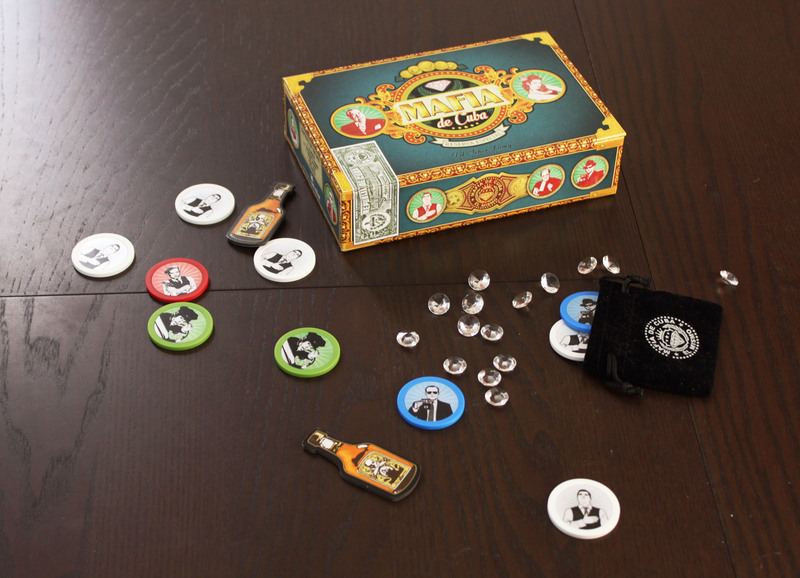 Despite the name, Mafia de Cuba is not much like the popular Mafia game (or its otherworldly spinoff, Werewolf), other than the secret roles involved which are sort of inherent to the genre. The hook here is that each player essentially gets to choose their role rather than having it assigned randomly. Here’s how it works: one player is the Godfather (okay, they don’t have a secret role). 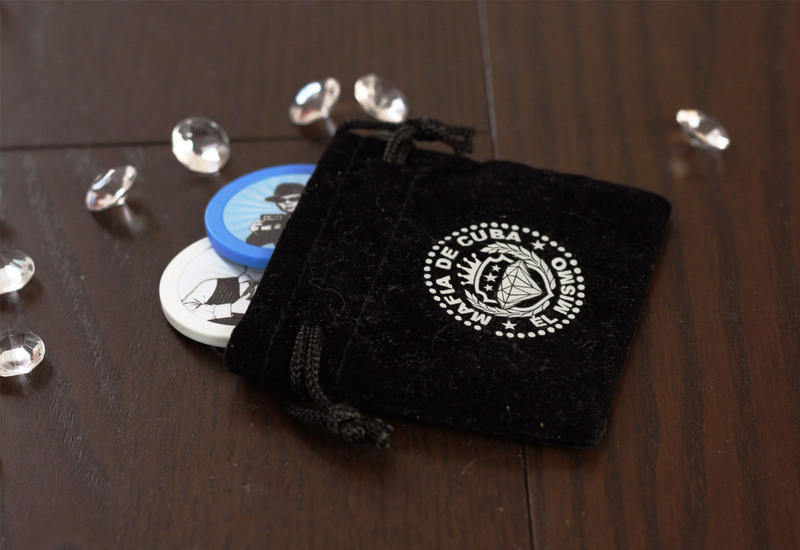 That player starts with the game box (which is cleverly designed to look and open like a cigar box with a hidden compartment) filled with 15 diamonds and several Role tokens. The Godfather may remove up to 5 diamonds for safekeeping. Then, the Godfather passes the box to their left. Each player takes the box, reaches into the hidden compartment, and removes something from it with the utmost secrecy. Your take determines what role you play. 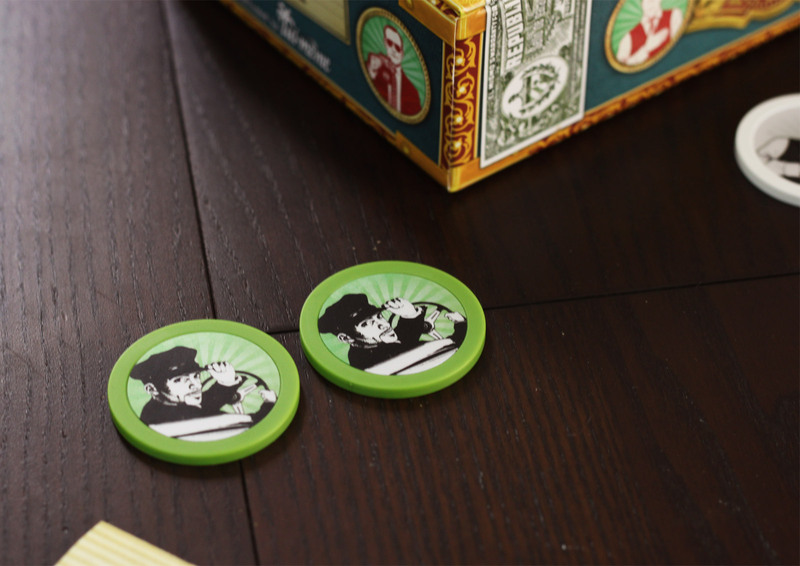 To mix things up a bit further, the FIRST player in the circle can remove one extra Role token regardless of what they took for themselves, effectively and secretly removing it from the game. When the Godfather gets the box back, they get to check the remaining contents. Then, the questioning begins. The Godfather can ask anyone any question (usually about the contents of the box or what they claimed to have taken from it) in order to try and determine who has taken diamonds. Players can also volunteer information, lie, tell the truth, blame someone else, or do anything except actually showing what they took. At any point, the Godfather may point at someone and demand they empty their pockets. At this point, that player MUST reveal all of what they took. 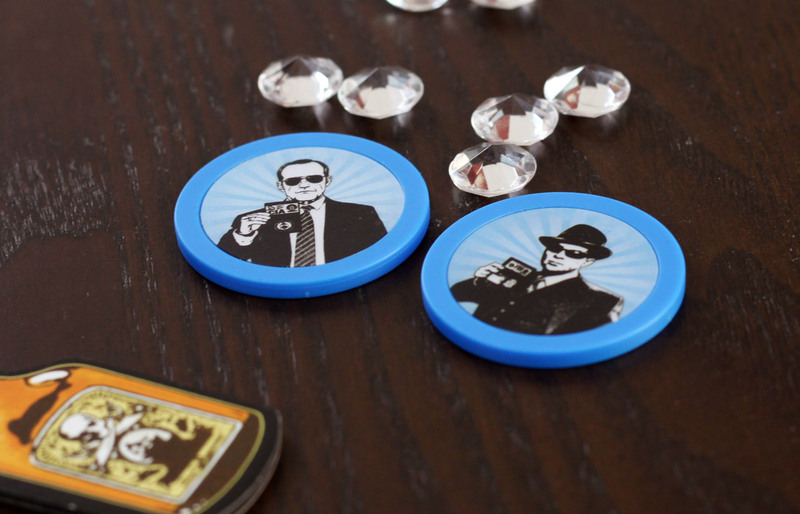 If they took diamonds, they’re eliminated and the Godfather gets the diamonds back; anything else besides an agent, and the Godfather must give them a whiskey token as an apology. 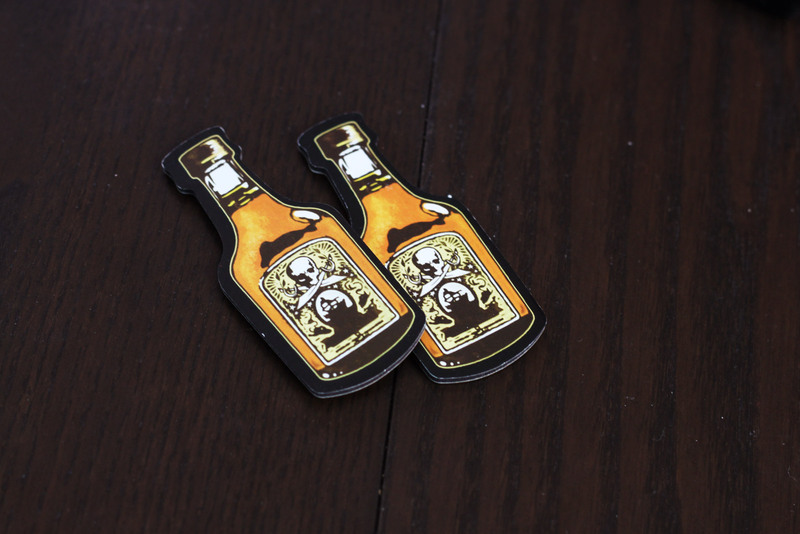 Of course, if there are no whiskey tokens left to give, the game ends, and the Godfather certainly loses. The Godfather wins if all 15 diamonds are retrieved. Henchmen win along with the Godfather. A Thief wins if the Godfather guesses wrong too many times, they have the most diamonds of all the thieves, and they haven’t been eliminated. The Driver wins if the player to their right wins. Street Urchins win if any thief wins. There’s one “Advanced” role called the Cleaner, which can be mixed in for experienced players, but I’ll let you discover that one on your own. In the glut of socially-driven games based on secrecy, misdirection, and (usually) lies, these hidden-role games really have to be something special to stand out among the crowd. And I would say that Mafia de Cuba does have its own spark, its own flavor that makes its existence worthwhile. Yet at the same time, I wouldn’t necessarily recommend Mafia de Cuba to everyone. It might be the gamery-est of all the social deduction games out there, which means the people who will enjoy this most are the people who really get in to these kinds of games. We’re talking people who not only enjoy them but also dive head-first into them, immersing themselves into the roles, committing to the lies, and reaching to the height of treachery just to see how far they can go. First things first. Let’s talk about the game box. It’s not often that I bring the game box into these things, but this time I am, because the box itself is a component of the game, and by golly it’s a good one. Yes, I just used the word “golly,” get over it. Anyhow, this is the main area where Mafia de Cuba has a leg up on other social games. Most of them are fairly lite on components: a few cards to assign roles which players immediately hide away, and possibly a few tokens for tracking rounds or something. With an emphasis on social interaction – arguing, convincing, lying, and questioning – these games get by just fine with minimal cardboard. But having that cigar box really adds to this game. Immediately, you fall into the game world as you try to subtly lift the secret compartment so that no one can tell what sort of thing you’re taking out of the box. It handles and feels like a cigar box (okay, to be honest, I’ve never actually handled a cigar box, but I’ve seen movies!). Classy components are a great way to take a thematic game to the next level, and they nailed the design of the box here. It doesn’t hurt that the diamonds look like diamonds and the role tokens have substantial heft (think Splendor tokens). It’s just too bad that those things are handled once then shoved away into your pockets or what have you to keep them hidden. The whole idea of choosing your own role definitely adds a unique flavor to the game. In a way, it becomes more accessible; after all, if you don’t want to be forced to lie, you can just choose a henchman token. (That does, of course, assume a henchman is available for the taking). It also greatly affects the information available in the game; not only do you know what you are and know who the Godfather is, you know what was in the box when you received it (or rather, what was removed from the box before it got to you). The trick is, while you may use that extra information to deduce who is lying, you still have to convince the Godfather that you’re the trustworthy one. In a way, strategy starts right at the selection phase; you have to decide if you think you can pull off the thievery, and if not, what your best alternative is. There’s another unique spice here that adds to the flavor of the game, and that is the balance of teams. In pretty much every other hidden role game, the balance has to be carefully maintained – with X number of spies for Y number of players – lest the spies are able to too easily control the game, or are too easily blocked out of it without anyone knowing for sure who the spies are. 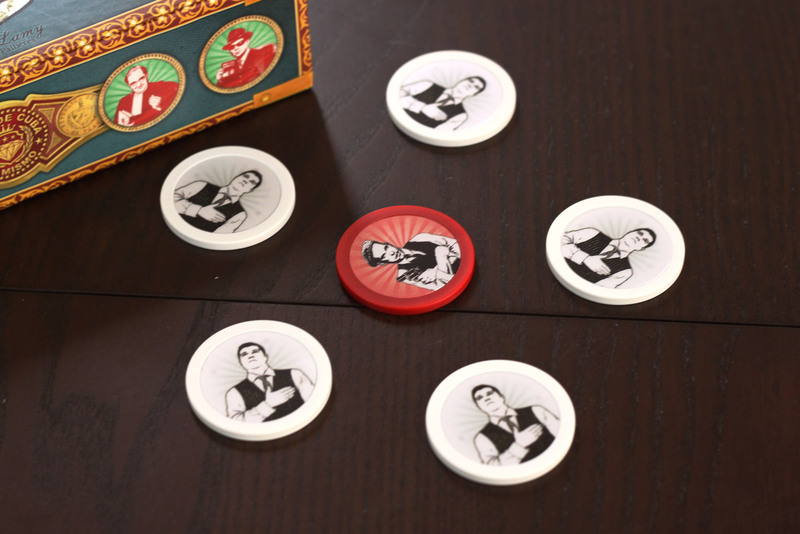 In Mafia de Cuba, the balance of power will almost always be different; in one game, you might have a few players taking large numbers of diamonds, and a lot of henchman. In the next, the diamonds might be spread more thinly. You might have several Street Urchins, or none at all. This balances out mechanically regardless of the role situation, since the only requirement is that the Godfather get his diamonds back. If they’re spread evenly, the Godfather has greater odds of picking out the thieves one by one simply due to mathematics. If there are fewer, wealthier thieves, the Godfather has more allies to help deduce the facts. The idea that the Godfather doesn’t know which is the case only serves to add intrigue. But within all these features lies the complexity, the gamer-level challenge of Mafia de Cuba. Because everyone has a bit of information, it can be very easy to slip up and drop the wrong bit of information. When that happens, it’s nearly impossible to recover. Unlike, say, The Resistance where you can play the fool and act as if either you misunderstood the question or your answer was based on false information, once you give it up here, you give it up for good. And look, the game isn’t that long, so even if you do make a big mistake that traps you, the round will soon end and you can try again. But I think more casual players will have a difficult time grasping the nuances or figuring out what lies to tell. It’s not just about saying “I’m a henchman.” You’ve got to provide information about what’s in the box, and it has to line up with what everyone else is saying. That strategy, too, of selecting your role pushing the difficulty up a bit. When you’re simply dealt a role, you only have to figure out what to do with that role. Even if you don’t prefer to be the Spy, if you get the Spy card you just deal with it. You focus on blending in, or pushing the blame on to other people. Your role gives you direction, and breaks the game into easily digestible chunks. 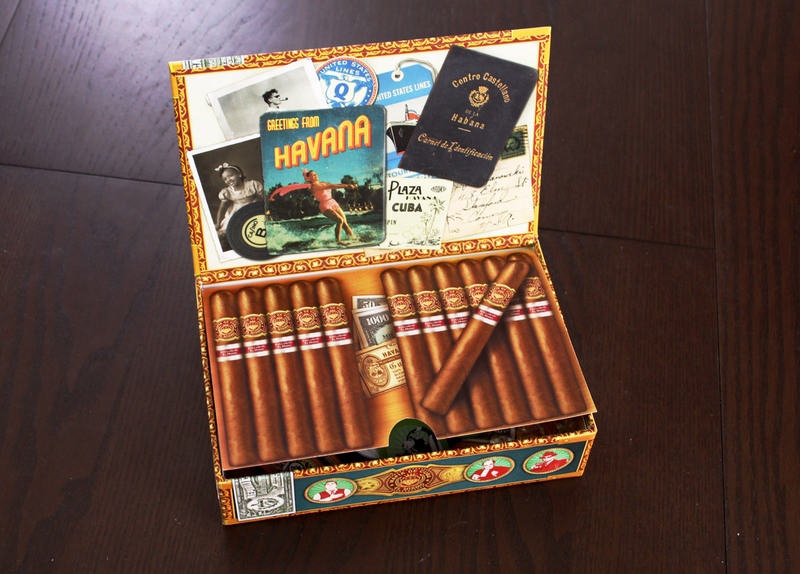 In Mafia de Cuba, you have to look in the box, think about what’s there, decide what role you want to be, think about what that means for your strategy, try and remember everything else that was in the box, and possibly decide just how MANY diamonds to try and steal. That’s a lot of information to parse right off the bat, and the only other option is to play as the Godfather, but THAT role has the pressure of being the One Who Has To Figure It All Out. I’m afraid that people who aren’t die-hard hidden-role fans, especially more casual players and non-gamers who might enjoy the Resistance, Spyfall, or even Werewolf, would become easily overwhelmed by Mafia de Cuba and turned off to the whole experience. The game is at its most fun when people are willing to take risks; when they pocket as many diamonds as they can squeak by, just to see if they can do it, even if would be obviously a better choice to take something else. You need people who want to try different roles and are willing to just go for it, and avoid playing safe. It’s best when someone can figure out a lie that dumps someone three people down the line under the bus while keeping the math steady. You don’t need people who never want to be the spy/traitor/thief role because those people won’t be forced out of their comfort zone, and will often skew the game against the thieves when they are forced. The first thing is just the nature of the flow of information in the game. There’s almost always a “hot zone” so to speak – two or three players that are arguing about who had what tokens in the box, and who is lying about it. That’s fine, that’s part of the game, but the problem there is that in a large group of 10-12 players, focusing on 3 players at a time tends to exclude the rest. Sure, they can try to participate; figure things out for themselves, accuse someone of lying, etc, but ultimately the Godfather is going to focus on the small group of people where the key information lies, because anyone outside of that might be lying too. It becomes easy for people to become disengaged, to lose focus, and to stop being a part of the game. Since the Godfather drives the action, it’s up to the Godfather to keep everyone involved, but that’s not always the best choice insofar as trying to figure out who has diamonds. You’ve also got a bit of player elimination – if a thief is caught, they’re out. Usually games don’t go on for too long, but it is possible to catch a thief early on, then spend more time than is comfortable to wait figuring out the rest. That’s not particularly fun for the player sitting out. I also found the rule for the Godfather about removing diamonds to be a little odd. I get the idea of adding some uncertainty at the start of the rotation, but it seems like a generally good idea for the Godfather to keep most of the diamonds, if not all of them, every time. The whole point is to get BACK all the diamonds. It’s like saying “you need 15 points to win, but you can choose to start the game with up to 5 points if you wish.” I believe it serves to add some uncertainty for the earlier players in the rotation, but I’m not really seeing how that helps the Godfather in the long run. At least, it doesn’t seem to be worth leaving any more than 1 or 2 of the 5 available diamonds in the box. You’ve also got a lot of “Wild Card” roles that aren’t quite as strong as real, actual roles. The Agents are a more interesting Wild Card, but the Driver has no motivation for himself. You just don’t have any good plays if you’re not sure exactly which team you’re on. The Street Urchins, too, feel a little weak. The last player is almost guaranteed to be an Urchin, if only because it’s highly unlikely for role tokens to make it that far around the circle, and the odds of winning with another thief are better than winning alone. The Godfather immediately sees what is left after the last player chooses, which makes it easier to detect a lie. Oh, and the first player’s option of removing a role from the game, that’s pretty powerful, but also waters down the game. The only real interesting choice is to remove a Henchman; but you can certainly remove one of the Agent tokens to make the game a lot safer. Removing the Driver is almost meaningless. I guess part of what I’m trying to say is, it often seems like there are better choices than others when selecting roles, if you want to maximize your chances of winning. But these choices are sometimes at odds with a more interesting, dynamic, and fun game. Which is why this works best with a more dedicated group. If people are willing to skip the easy, obvious choice in order to try something risky, the game has an extremely high potential for excitement. Active engagement is key. The “choose your role” hook is clever and unique, and passing the cigar box around feels thematic and fun. It’s a pretty quick game – usually lasting 10 or 20 minutes, so you can easily play a few quick rounds before moving on to something else. 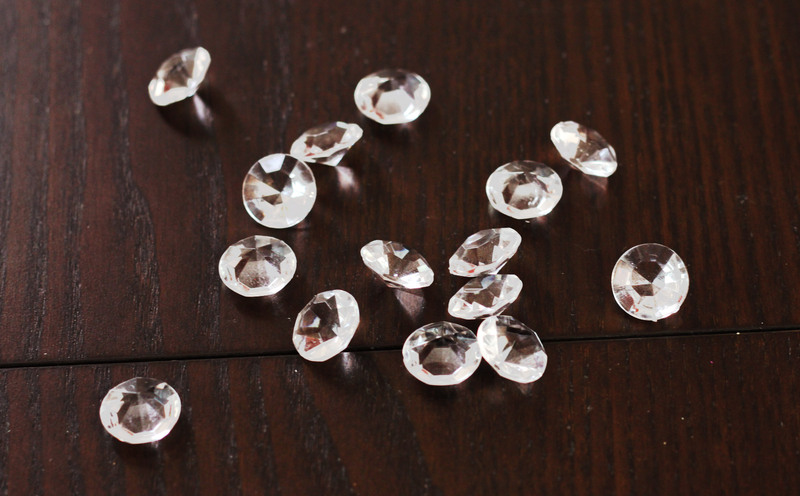 The diamonds are a neat component that can be hard to resist stealing. I worry that more casual players might just give up before they ‘get it,’ but if you and your group love these sorts of social deduction/hidden role games, I highly recommend giving Mafia de Cuba a whirl. 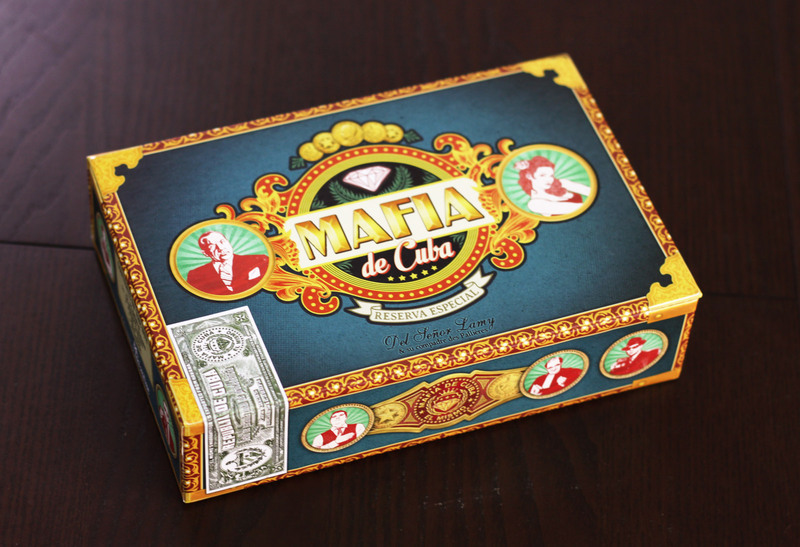 iSlaytheDragon would like to thank Asmodee for providing us with a review copy of Mafia de Cuba. Wow! That sounds a really unique social deduction game… added to wishlist. I’ve got to disagree with one of your cons – I’ve introduced it to casual gamers and had a blast.